Bring some ice cream fun into your classroom without all of the melting mess! 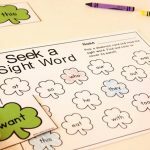 This Editable Ice Cream Sight Word Game is sure to be a hit with your students as the weather warms up. 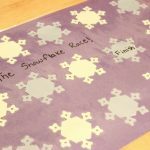 Of course the best part of this FREE printable activity is it’s EDITABLE! That’s right, you choose the words you want your students to work on! 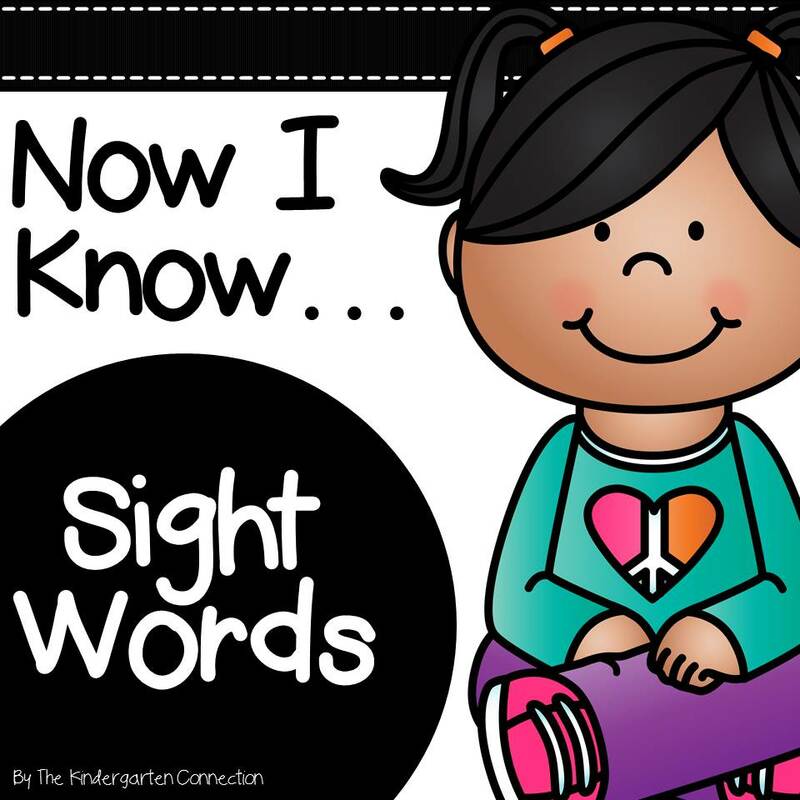 Read to the end to find out our favorite way to use this sight word activity! *Pair this with our Summer Centers and Activities for even more learning fun this summer! 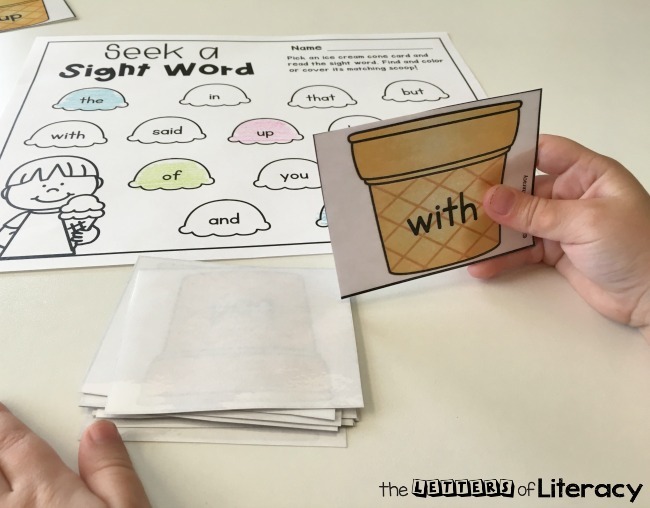 This Ice Cream Sight Word Game is our newest addition to our Editable Sight Word Game Series! Don’t you just love it when we give you more control?! 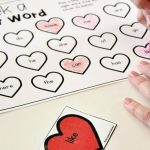 Simply download this FREE printable and type in the words you want in the sight word generator and it auto-populates the words for you on the ice cream cones! You can have your children work on spelling words, sight words, dolch words or silly words because ice cream sometimes makes us a little silly! Tip: Print different word lists for small groups. 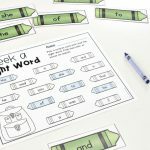 You can focus on sets of words for each group of kiddos! 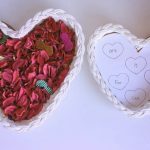 This activity is suitable for Kindergarten and first grade students. You can use this in your homeschool or traditional classroom setting. Print, laminate, and cut apart the ice cream cone words. 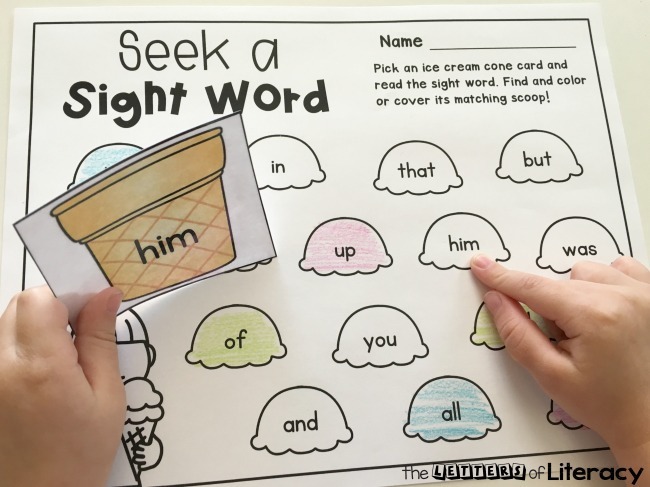 Place the Seek a Sight Word Coloring page in your literacy center with crayons and sight word ice cream cones. Students will take an ice cream cone card from the pile, read it, and find it on the recording sheet by coloring it in. The activity continues until all of the sight word ice cream cone cards have been read and colored in on the recording sheet. Two players share a recording sheet and each pick one color crayon that is their designated color for the remainder of the game. Player #1 draws a card, reads the sight word and finds it on the recording sheet and colors in the ice cream scoop that matches. Player #2 then proceeds as player #1 did. If a player doesn’t know the sight word, they must put the card at the bottom of the pile and they miss their turn. The player with the most ice cream scoops colored at the end of the game is the winner. 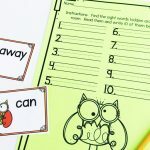 This is my all-time favorite way to use this sight word game! Just grab some small candies that look like ice cream toppings (use pom poms or other small manipulative if you are looking for a food-free option). Children can play with a partner or alone. 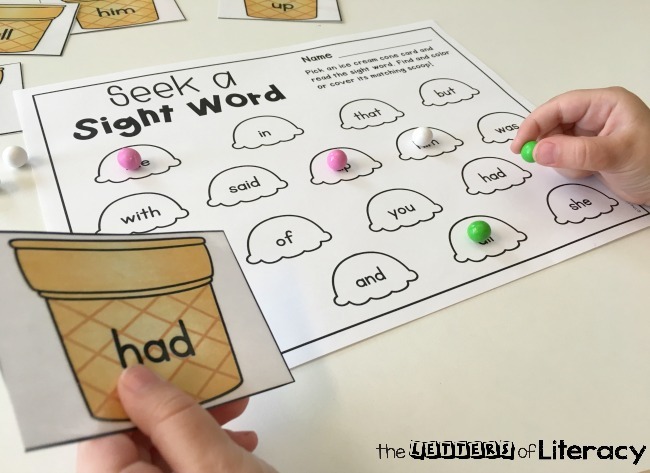 The game proceeds as usual with reading the sight word but this time students get to “cover up” the sight word with a candy or manipulative. 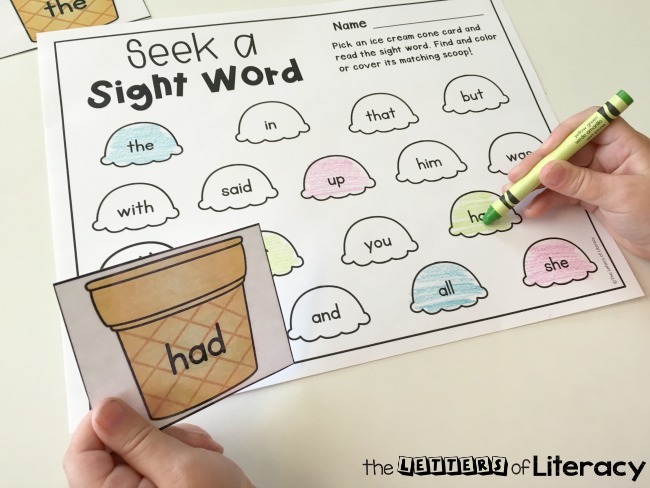 It’s a neat way to put a twist on the seek a sight word game. 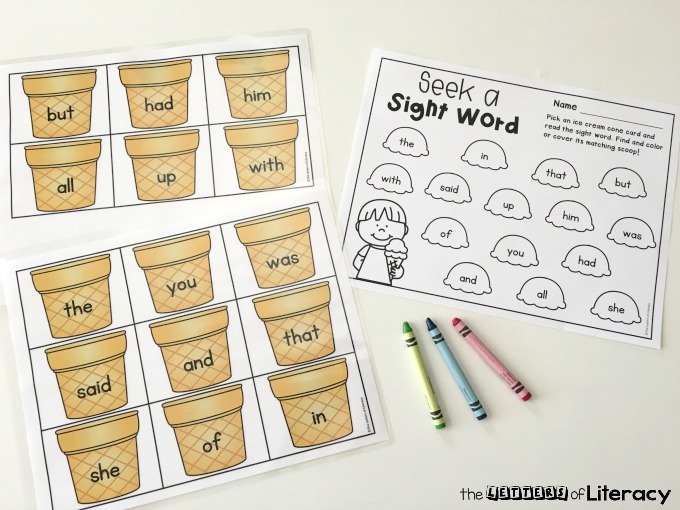 Ready for some ice cream sight word fun? 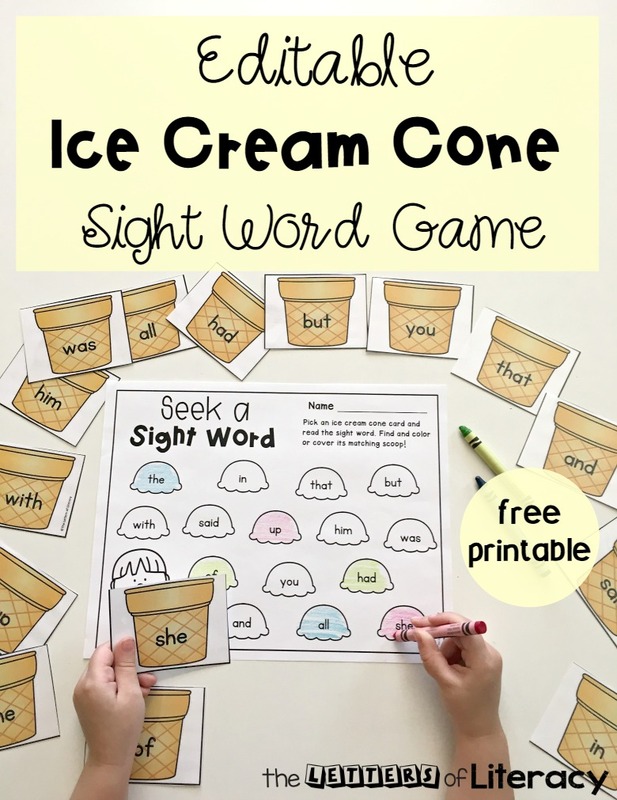 Grab your copy of this Editable Ice Cream Sight Word Game by clicking the blue button at the very end of the post. 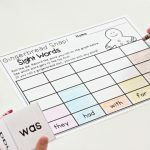 You might also be interested in our Editable Sight Words Centers and Activities! 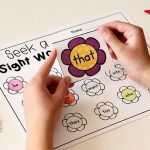 This pack includes over 10 different Editable Sight Word Games that can be used ANYTIME of the year!